What’s new in 3.5? Glad you asked. XaoS 3.5 has been released for download. This version contains a new Portuguese translation, several bug fixes, and some UI improvements for the Windows version. So maybe I over-reacted. I find their use of version numbers is a little strange. 3.2 added language support for Romanian. 3.3 added a formula parser. In addition, 3.4 includes several fixes and improvements to the native language support and translations. The most significant of these is that accented characters are now displayed correctly on modern systems. I’m going out on a limb here, but I think they’re reserving the big 4.0 version number for the introduction of Esperanto. The formula parser is the big deal now with this program. Before you were limited to the dozen or so hard wired formulas and their 6 variations in different planes. Most of the formulas were interesting to look at for a little while and probably made for a nice introduction to fractals but there were only a few that you could really do much with. The formula parser changes all that although (like most formula parsers) it can be a little slow. But now at least there’s an unlimited number of formula options by which to make use of Xaos’ great rendering capabilities. Xaos has the best random color palette generator of any fractal program that has ever been made and probably ever will be made. Combined with it’s simple edge detection filter (which was used to give the above sample images their line drawn look) it multiplies the creative possibilities of what may appear to many fractal artists as a rather simple fractal program. 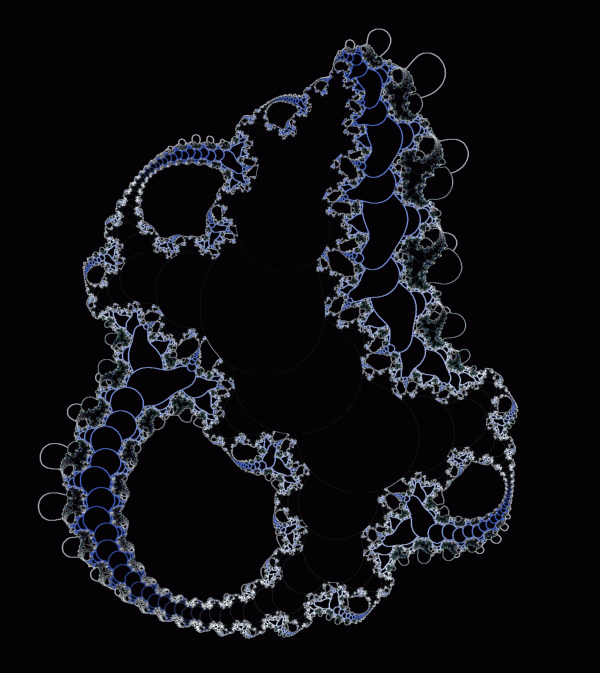 I don’t know who or how many people use Xaos in serious way to make fractal art. My impression has always been that the number is few. 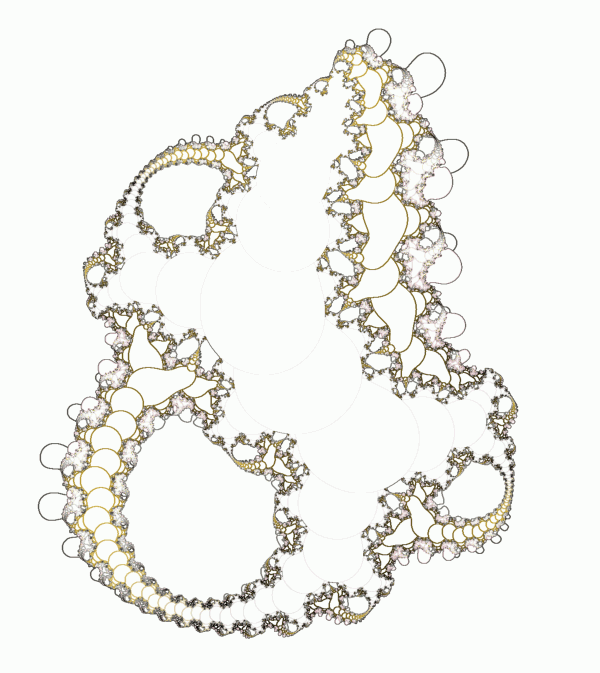 Most fractal artists seem to prefer Ultra Fractal and Apophysis. But I think Xaos, despite it’s simple and small-town look, is an algorithmic art program of the highest quality and one of the most creative tools that a fractal artist can find. One should never underestimate the importance of color and Xaos is virtually a magic wand of creative coloring. A few taps of the shortcut key “P” on your keyboard and you’ll see what I mean. In addition to all that, Xaos has some other well-known but still worthwhile creative tools. Fast Julia mode (push “J”) enabled me to create the above images from a rather simple user-defined formula (“COS(Z^2+C)/C”). In fact, here’s the parameter file for the above image (the white one is just the black one inverted in a graphics program). Note that there’s a place for user formula initialization. Uh, I don’t know what that means. But there’s another custom parameter to experiment with when you’ve exhausted all your formula permutations of SIN, COS and the other cousins of trigonometry. The beauty of Xaos is that the program places creative power at the touch of a single finger. That’s what good, algorithmic programming does. It lifts us little folks up onto the shoulders of giants. Hi, I'm one of the current maintainers of XaoS. Thanks for the publicity and the praise. I agree that our version numbers aren't really very indicative of the number and magnitude of new features and that is something we should work on. The version introducing user formulas probably should have been 4.0, for example… but oh well. If any people out there are using XaoS, we'd love to hear from you on the mailing lists, and if you have any feature suggestions, let us know and we'll try to be accommodating. I should also clarify that XaoS is cross-platform software, supporting Windows, Mac OS X, and Linux. Sometimes, a new version contains major new features for one platform and may seem like a totally ho-hum release for another. For example, XaoS 3.4 introduced a totally rewritten User Interface for Mac OS X but contained only bug fixes for Windows and Linux. Version 4.0 is going to contain a totally new UI for Linux but the amount of work that went into this will not be obvious to Windows users who won't see any benefit from it.